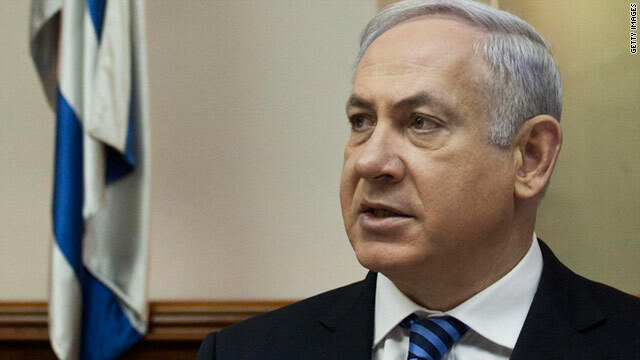 Israeli Prime Minister Benjamin Netanyahu told his cabinet that Israel is "anxiously monitoring" events unfolding in Egypt. NEW: A former Israeli diplomat says U.S. taking protests "in a naive way"
Israeli PM Benjamin Netanyahu: Israel wants "security and stability"
Jerusalem (CNN) -- Israel's public line on Egypt is clear -- it wants "stability and security in our region," Prime Minister Benjamin Netanyahu said Sunday morning, acknowledging that Israel is "anxiously monitoring" what's happening in the first and most important Arab nation to make peace with the Jewish state. "We must show maximum responsibility, restraint and sagacity and, to this end, I have instructed my fellow ministers to refrain from commenting on this issue," he added. But former officials will say in public what many believe the government is thinking in private. In an interview with CNN, Eli Shaked, Israel's ambassador to Egypt from 2003 to 2005, predicted that if Egyptian President Hosni Mubarak's regime falls, a new Islamist regime, hostile to Israel and western nations, will replace it. "There will be no democracy in Egypt," Shaked said. "If there will be democratic elections in Egypt in the summer or in the very near future, (they) will be the first and last democratic elections in Egypt." We must show maximum responsibility, restraint and sagacity and, to this end, I have instructed my fellow ministers to refrain from commenting on this issue. Where does U.S. go from here with Egypt? Shaked also accused of the U.S. government of "taking the crucial developments in Egypt in a naive way." "They have expressed opinions that may be right for Western ears," Shaked said. Eli Avidar echoed the sentiment. U.S. President Barack Obama's statements about the situation "put a lot of pressure on the regimes in the Middle East" and showed "a lot of disrespect" for Mubarak, said Avidar, a political analyst and a former Israeli envoy to Qatar. "The American administration does not understand the culture of the Middle East." "Democracy can be created only if you have the right institutions and the right society to absorb (it)," Avidar said. "Otherwise you will have radical extreme groups like the Muslim Brotherhood that will take over in no time over Egypt." The Brotherhood, Egypt's largest -- but officially banned -- opposition movement, does not appear to have started or organized the protests sweeping the country but called on its members to join them starting Friday. Avidar said the protests in Egypt have leaders of other pro-U.S. Arab countries "concerned about what will happen if demonstrations take place in their countries." "What will be the American position at that point? And I believe that they cannot count on the loyalty or friendship as they did before," Avidar said. When former President George W. Bush and his Secretary of State Condoleezza Rice pushed the Palestinians to hold democratic elections, Avidar pointed out, the militant Islamist Hamas movement came to power. He fears the same thing could happen in Egypt, he said. "If (the Muslim Brotherhood) goes and takes the leadership because of democratic elections, I believe that democracy will not continue in Egypt, because the fact is, the second that they take power, they will not leave it," he predicted. And Avidar made no bones about the overwhelming importance of Egypt to Israel and the region. "Egypt is a key player in the Middle East. It is the leader of the Arab League, a key player in the peace process, and I believe that the fact that instability is taking place in Egypt is very harmful to the peace process," he said. "This is definitely a major concern."